After years of use, your tile and grout can become discolored and saturated with dirt, grime, and bacteria. You can rely on Chem-Dry of OKC/Edmond to refresh the look of your tile and clean to the deepest pours of the grout. Our highly trained technicians use a specialized cleaning solution and equipment to remove soil and dirt that has built up over the years. Stop spending hours on your hands and knees scrubbing and cleaning. Allow us to renew the shine to your tile, stone, and grout throughout your home or business. It is recommended that your tile, stone and grout be cleaned every 12-18 months. This helps to ensure your home or business long-lasting protection. Chem-Dry of OKC/Edmond‘s service is perfect for many varieties and styles of tile and stone such as Saltillo, ceramic, porcelain, slate, granite and travertine. We understand that most homeowners don’t want harmful chemicals being used in their homes. All of the ingredients in our primary cleaner are safe and approved for your home and family. Before the on site cleaning process begins, we’ll perform pretests to determine the type of stone or tile to guarantee the safest, highest quality outcome for your home, especially when working with acid-sensitive surfaces such as marble, terrazzo, travertine and limestone. 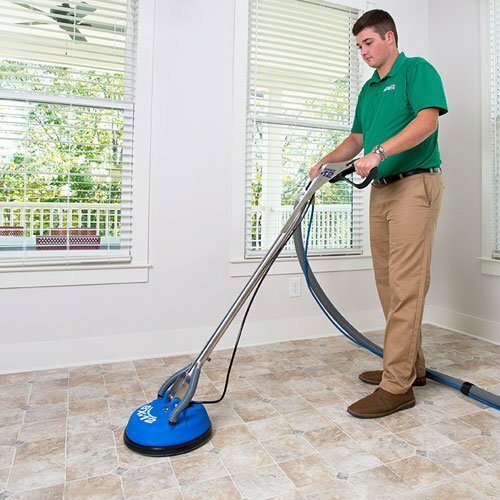 Our certified technicians also provide additional inspection, tape off the area to protect adjacent surfaces, and perform dry soil removal, clearing away surface dust and dirt for better access to build-up and more effective deep-cleaning results. We’ll perform quality checks along the way. If the results are uneven or do not meet expectations, they clean over the uneven area and check their results again, repeating this quality control process until they’ve reached the optimal result.